Cover: Johannes Vermeer (Dutch, 1632-1675), A Maid Asleep, 1656-57. Oil on canvas, 34½ x 30 1/8 in. (87.6 x 76.5 cm). The Metropolitan Museum of Art. Bequest of Benjamin Altman, 1913. 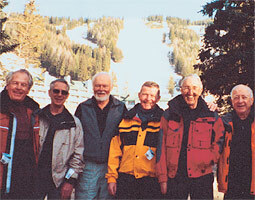 Members of WSC ski teams from the early 1950s gathered at Big Mountain, Montana, in March 2005: Bruno Richter '55, Jerry Gaiser, Bill Noble '58, Gordon McKenzie '55, Al Fisher '54, sandy Jacobson '57, Chuck (Ferg) McKillop, and Bard Glenne '57. "Everybody still skis tremendously," says Richter. "They're all in really good shape." In 1952 the Washington State College ski team placed first in the Northern Division, the Pacific Coast Conference, and the North American International Intercollegiate Tournament in Banff, Alberta. In 1953 the Cougars won every University and College meet they entered, including Banff and the National Intercollegiate Championship at snow Basin, Utah. The following year the National Intercollegiate Championship became the NCAA Division I championship, which took place in Reno, Nevada. The Cougars were favored to win that as well. But the coach of the University of Denver team managed to get two of the Cougars' skiers declared ineligible as transfer students, and Denver won. Fast-forward about 50 years. Bruno Richter '55, who like most of his teammates had skied all four events—slalom, downhill, cross-country, and jumping—and one of the two Cougars declared ineligible as a transfer student (he was not), was now head of VISA operations in Europe. He'd traveled from Germany in mid-April to visit VISA headquarters in California. He'd brought his skis along and rented a car and driven up to Squaw Valley. Richter got on the lift with another fellow about his age, and they struck up a conversation. Turned out the other fellow was from Whitefish, Montana. Well, you must know Bill Noble, said Richter, just on the off chance. "I am Bill Noble," said his newly re-discovered old friend ('58 D.V.M. ), who was on the ski team with Richter in 1953. 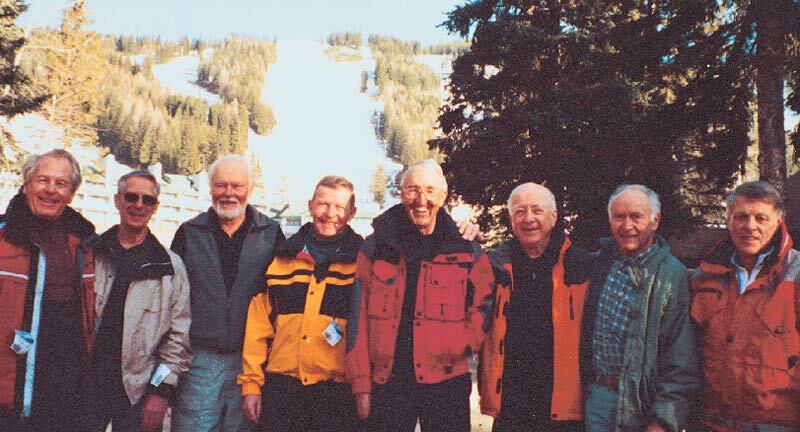 From that chance meeting, the WSC ski teams of the early 1950s reformed. Richter and Noble got in touch with others they could track down, and they got together to—what else?—ski. That first reunion year, they met at Whistler, where one of the skiers has a house. They've also met at Rossland, where one has a house. And Squaw Valley . . . where yet another team member has a house. Joining Richter and Noble were Jerry Gaiser, Gordon McKenzie '55, Al Fisher '54, Sandy Jacobson '57, Chuck McKillop, and Bard Glenne '57. Missing, however, were the Norwegians who gave the Cougar ski team such an international cast: Svein Huse '53, Einer Husevaag, Nils Hegvold '53, Lars Hals-Hagen '55, Mads Danielsen '56, Sverre Wegge '55, and Toby Falkanger. But the Norwegians, some of whom also migrated to the University of Idaho, were only the obvious international names. Gordon McKenzie is Canadian, as is Al Fisher. George Merry '55 skied on the 1952 Canadian Olympic team before coming to WSC. Richter himself came to WSC from Germany as a Fulbright scholar. The ski team traveled extensively all over the Northwest, with meets in Rossland, Reno, Stevens Pass, and other locations. Richter admits there were extended periods when he didn't see the inside of a classroom. Aside from the success of the varsity ski team, skiing played a large part in the WSC culture during the 1950s. (The sports page of the Evergreen seemed more diverse back then. Skiing got nearly as much attention as football. Also getting considerable play were women's skiing, gymnastics, swimming, boxing, wrestling, and of course Buck Bailey's baseball team.) Evergreen stories breathlessly tell of campus excursions by bus and accompanying caravan to the St. Joe Ski Bowl on the Palouse Divide, just south of Emida, Idaho. Although it was gone by the time Richter arrived, a ski jump occupied the hillside below the present-day CUB. The St. Joe ski area was longtime athletic director "Doc" Bohler's dream, as the Evergreen recounts in a 1951 issue. Bohler had started scouting the area in the mid-1930s for a good ski area within an hour's drive of campus. The Forest Service finally directed Bohler to a natural "snow pocket" near Emida. After Bohler approved the site, WSC cleared a ski area. In the late 1930s, the Civilian Conservation Corps and Forest Service built a lodge there. Richter and his teammates plan to regroup again this year at Rossland the end of February. In addition to himself, Fisher, McKenzie, Jacobson, Glenne, McKillop, and Gaiser, he also hopes to pick up Don Wells along the way. Wells was the head of the philosophy department at WSC for years and was also the faculty adviser for the team.